It was my third time in Hong Kong last April 3 and 4, we hopped on a ferry from Macau and it was an hour of journey. We came directly to hostel by taxi and prepared immediately. Our first destination was in Ocean Park, it was my first time so I was kinda excited. We arrived there around 9 in the morning and immediately enjoyed some rides. 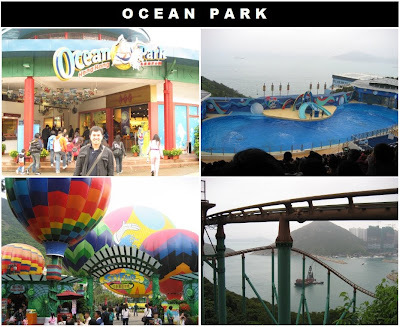 It was a fun place and we even watched a dolphin and sealion show. I don't know why I was teary eyed watching the dolphin show, I think it was because of the documentary film The cove that I saw the other month and I was really hurt by the scenes of dolphin killings. We also checked the panda habitat, took the cable car and we had our lunch there which was a birthday treat from Razel. Later that night we decided to visit Victoria Peak and the people were jampacked. When we arrived there, we were all disappointed as the place was full of fog and we can't even view the buildings downside. Twas a good thing that we purchased tickets for Madame Tussaud's wax museum. At least we had a purpose reaching the place. After visiting celebrities and other popular personalities in their wax form, we looked for a Starbucks to have a sip of hot coffee as it was very cold that time. The next day, we woke up so early to accomplish our schedule. As early as 7AM, we were already prepared and arrived on Ngong Ping cable car at almost 9 in the morning but the station was not yet opened. So we decided to ride a bus that took us to the Big Buddha. 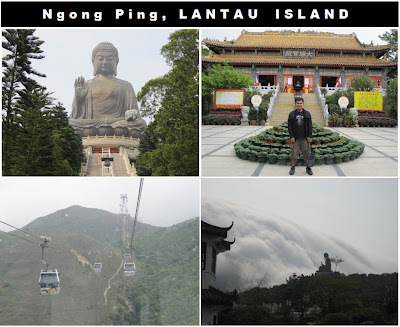 Ngong Ping is a highland in the western part of Launtau Island. The big buddha is also known as Tian Tian Buddha which was situated amidst the hills which is about 34m tall. The view of this buddha was magnificent and reaching the top was a very fulfilling. From the top we saw many hills nearby on which we got a closer view when we took the cable car going back to Tung Chung MTR. After that trip in Lantau Island, the girls went to Disneyland while I took the way going to Sai Kung where I met my friend's mother. Wendel's mother is a resident in Hong Kong and put up a Filipino restaurant. 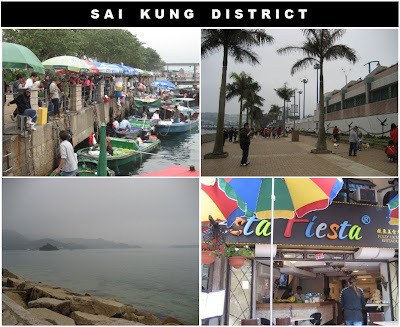 Sai Kung was a very nice place and the second largest district in Hong Kong. There were many boats that you can rent that will bring you to several islands around the area. When I roamed the area further, I saw a lot of dogs! Nice and cute dogs that were being toured within the vicinity. I looked for the restaurant Fiesta Fiesta and had my early dinner and it was a treat from Wendel's mom. The foods were really great and the atmosphere was very calm. I even noticed a special touch and design with the food preparation. Twas two thumbs up!